Choosing the best nursery glider for you depends on the room’s décor, the available space, and your family’s budget. This article contains five of the best nursery gliders currently on the market, sorted from the most popular. We analyzed details such as materials, mechanism type, and comfort! 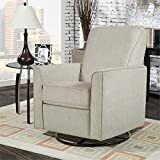 The Baby Relax Mikayla Swivel Gliding Recliner is the best nursery glider on this list because has many comfortable features that soothe the baby and the mother alike. The glider will ensure that you never feel like leaving the child’s room. It has a ball bearing mechanism that enables it to both rotate and swivel in a smooth gliding motion. 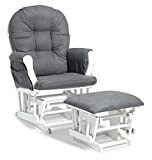 This nursery glider/recliner also has a built-in easy-to-pull mechanism that helps prop your legs up on the leg rest, thus allowing you to recline. It comes in different colors to help you choose a glider that fits your taste and preference for décor. Moms who purchased this glider from eBay say that it is the best reclining glider for nursery as it is incredibly comfortable and glides smoothly and quietly. This glider is sturdy, comfortable, and is easy to assemble at home and use. You can choose from a variety of colors based on your décor. It occupies quite a lot of space. Difficult to rock without the footrest. The DaVinci upholstered swivel glider with Bonus Ottoman is designed to assist moms during the baby feeding time. This glider is made from 100% polyester and comes with a bonus ottoman for resting your feet. Its design has a high back for head and neck support and you also get a matching lumbar pillow for more back support. A majority of the moms who have used the glider says that the chair offers a great deal of comfort, mostly due to its high back. The chair is wide providing a large sitting base. It is sturdy and highly durable. It would require a regular upholstery cleaning of the fabric. The Harmony Swivel Glider is a piece of sleek and contemporary furniture designed for modern homes. It is small in size, therefore fits most baby’s rooms and other areas in the house without occupying too much space. You can swivel a full 360 degrees in a quiet and smooth glide. This glider has a reclining mechanism which allows you to rest your back. Its arms are padded with contemporary frame features made from wood, polyester foam, and plastic. 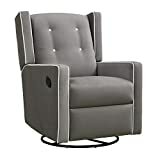 Moms who have bought this glider say that it is the most comfortable chair they have in their homes. The chair is not bulky and is easy to assemble. It is durable since it is made from high-quality materials. Its swivel and glide are perfect. A re-upholstery may be required after some years. The footrest is difficult to put down. Recommended read: If you are interested in other methods of increasing comfort for you and your baby, also see our picks for the best nursing pillows available for purchase this year! The Stork Craft Custom Hoop Glider and Ottoman are an ideal combination for your baby nursery. It provides a large sitting space, a cushioned padding arm, and side pockets to store baby stuff. This chair is made of metal enclosed with ball bearings that enable it to move smoothly back and forth. It comes with cushions of different colors for you to choose one that compliments your décor. The solid wood construction gives this glider a sturdy feel that makes it durable for years. The cushioned ottoman is also included in the purchase, giving you the ultimate relaxation you want when soothing your baby. This chair is sturdy and durable as is made from high-quality materials. Very comfortable with foam-stuffed cushions and high-quality soft fabric. Backrests not tall enough to support the head. The Babyletto nursery glider is a deluxe glider for nurseries as it also comes with a hidden push-button control panel and a USB charging port. This very comfy chair can swivel 270 degrees and can also glide back and forth or be fixed in an upright position. It comes in three lovely, stain-resistant colors: gray tweed, coal gray, and white linen. The manufacturer mentions this nursery glider is constructed and upholstered by hand so you can be sure you are getting your money’s worth. Reviewers mention this glider is extremely comfy and most of them are extremely happy with their purchase. If you’re looking for a top of the line model, this is the absolute best nursery glider you could get. Comes with a USB charging port and a control panel. Works for small spaces without sacrificing comfort. Offers good lumbar support and can also support the head of a taller parent if dozing off. The electronic recline system can be faulty at times. In the higher price range than other gliders on this list. You probably noticed the best nursery gliders come in a large variety of designs, sizes, and features. But given you know how to choose and where to choose one from, this should be a breeze. Which one do you think is the best nursery glider for you? Editor’s note: this post was first uploaded in June 2017 and has received multiple updates, including the most recent one in April 2019.